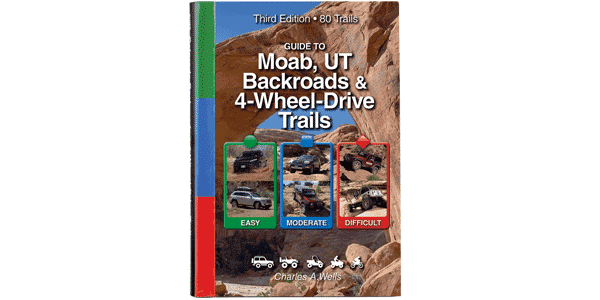 Don’t miss the most popular trail in Moab. This may be the most popular trail in Moab. It’s very close to town, not too long, challenging in a fun way and amazingly scenic. If you only have time for one difficult trail, this is the one you want to do. The trail is intertwined with the Slickrock Bike Trail. Be very careful at crossing points and remember that bikers always have the right-of-way. There is a small fee to enter the Sand Flats Recreation Area. The main trail features several large ledges that can’t be bypassed, but most of the difficulty comes from numerous narrow steep sections along slickrock fins. Optional extreme obstacles Hell’s Gate, Mickey’s Hot Tub, the Escalator and Tip-Over Challenge are dangerous and should only be attempted by expert drivers using an experienced spotter. For these obstacles, front and rear lockers are required. Major vehicle damage is not unusual. It is extremely dangerous to ride an ATV on this trail without a helmet. Stay on marked route at all times.